The Wichita Refuge herd was the last of the unique 7 families assembled. Although the original stock were purchased in the general area of the other 6 families, there is no recorded genetic connection. Since 1930 when the WR herd began it's genetic blend there were very few introductions from the other 6 families except from the Yates blood. The Yates blood was somehow approved to introduce to the government herd, possibly in exchange or as a gift. In 1965 the WR leadership determined that the base herd was getting extremely in-bred. A deal was struck with J. G. Jack Phillips to do a bull trade. The WR could go to Phillip's Battle Island Ranch and select a bull and Phillips could go to WR and select a bull. Phillips selected WR 2031, a brindle bull with over 40" horn, almost a record at that time. In the book FILLET OF HORN there is a photo of Phillips and WR 2031. Phillips was very pleased with the bull and used him for his whole life. In fact the bull Clear Win's dam goes back to WR 2031 five generations back. 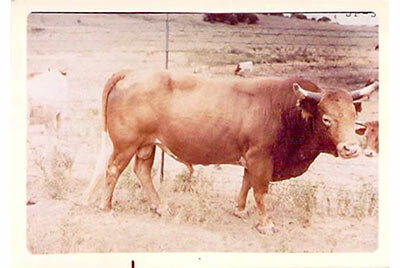 The WR people selected a bull from the Phillips herd who they named JP 3 (pictured below). He was selected for the WR herd to add horn and additional red color. The WR people were not pleased with their selection although Phillips offered them over 3 dozen bulls to choose from. JP 3 sired WR 2615 who was black and white and used for many years by WR. JP 3 was much larger than the inbred WR bulls and was a ruthless fighter. As a result, the WR cut off his horns to give the smaller bulls an equality. Equality is not a new thing in government. JP 3 was born in 1965 and sold by WR in 1972.